Getting to watch an Osprey is always a magical experience, they’re skilled hunters and dramatic in flight. 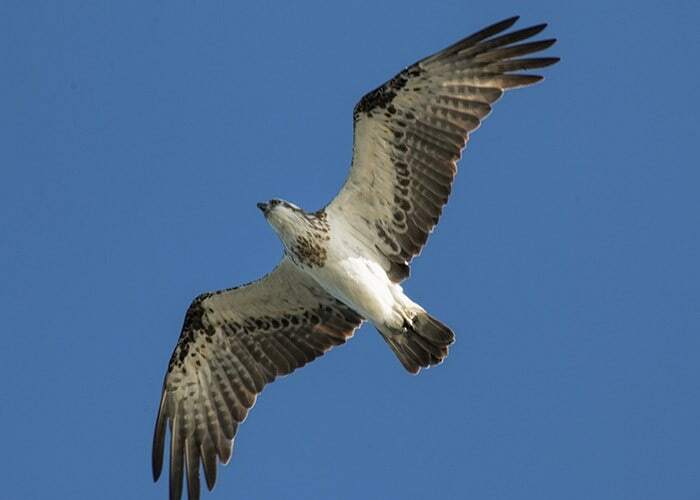 Earlier this week in Hervey Bay we were lucky enough to see a good number of Eastern Osprey at Urangan, Dundowran and Gatakers Beaches. These photos were all taken on that trip. The Urangan Pier is an easy spot to access and very likely to provide a sighting or two, the birds have got used to fisherman tossing small fish from the end of the pier and aren’t too proud to grab one back out for an easy snack, they also seem to find the posts an easy resting place to eat their catch. The trees along the front at Urangan are also worth checking, we saw four birds in this area in a short walk out to and along the wharf. At Gatakers Bay there were three birds, they appear to be two parents and this seasons fledged chick, there was also a nest nearby. The third good sighting was at Dundowran beach, a long sandy and quiet beach north of the main tourist area, another pair were seen hunting here. 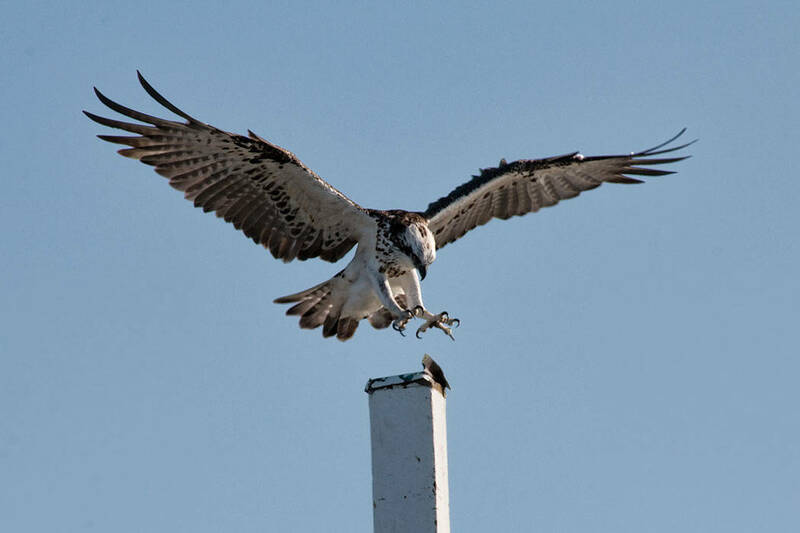 Osprey build sturdy nests in waterfront locations from driftwood and sticks then line them with grass, bark and seaweed. 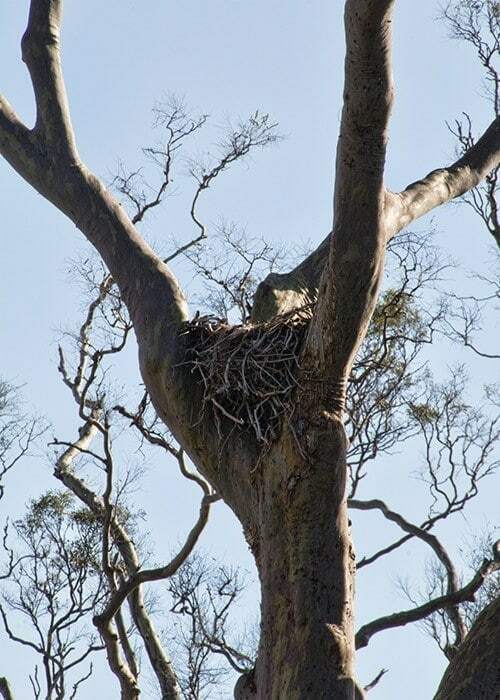 These nests are often used by the pair in successive years. The one below is built into a tree but they’re also often seen on man made structures like radio masts. In a few places in south east Queensland you’ll also see purpose built platforms when trees previously used for nest have had to be removed and a replacement has been provided, an example is at the Sandy Camp Road Wetlands in Brisbane. 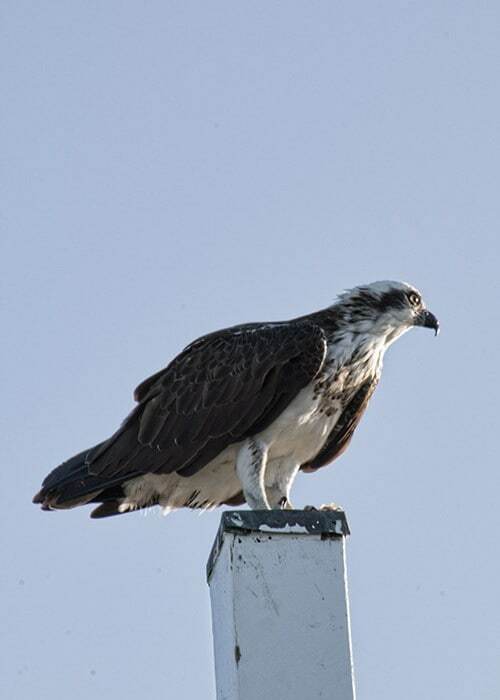 Osprey usually lay 2-3 eggs in the nest with the female doing most of the incubation and male sourcing fish. Osprey hunt fish flying over coastal waters, when they spot a fish they dive feet outstretched and grab the fish with their talons. Sometimes the fish is taken from the top of the water but they do go right under then immediately take off again with their powerful wings. They take the fish else where to eat, often into a tree but you also see them eating on the waters edge. 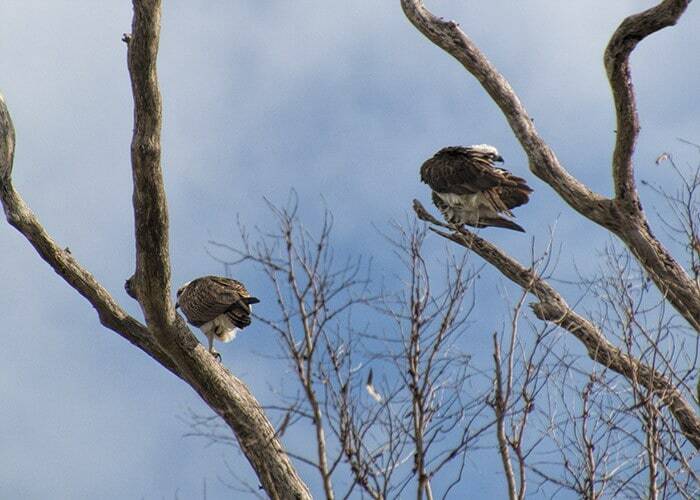 The Osprey is a medium sized raptor and quite a bit smaller than the similar looking White Bellied Sea Eagle. The colouring of both birds vary between the sexes and due to the maturity of the bird. There are a few ways to tell them apart besides the size which can be harder to pick in flight, one is that the Osprey has sharply bowed wings when flying as you can see below where the Sea Eagle’s are held much straighter.